UCCE Master Food Preserver Dennis Prendergast provides a basic introduction to safe boiling water and steam canning techniques. Learn how to can high-acid foods. 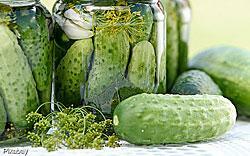 This class focuses on canning pickles. View our Demonstration Schedule or download our 2019 Schedule (PDF).